Cisco this morning announced that it has acquired San Francisco startup Versly, a privately-held company that develops collaboration tools that integrate with Microsoft Office applications. Financial terms of the acquisition were not disclosed, but all Versly employees will be integrated into Cisco’s Collaboration Software Group (CSG) upon the close of the acquisition. 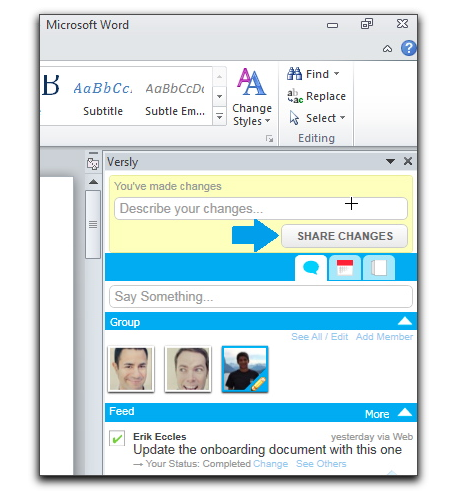 Versly builds plug-ins that enable groups of people to collaborate around content in Word documents, Excel spreadsheets, PowerPoint presentations and emails. From the looks of it, the service was still in private beta, so this is a quick exit for Versly. Versly’s software will be integrated into offerings such as Cisco Quad, Jabber and WebEx. According to its CrunchBase profile, Versly was backed by seed funding raised from Accel Partners, Baseline Ventures, 500 Startups and a couple of angel investors, including Scott Dietzen, Kenny Van Zant, Jonathan Katzman and Rasool Rayani. The company was started by former BEA and Sun exec Benjamin Renaud and former Yahoo-er Erik Eccles. The rest of the team is detailed here.